Before my husband and I moved to our new house, we never had a headboard. Strange, but true. Our first apartment had a glass partition that did the job. For our other place: well, with two tiny children who often wanted to sleep with us, we just ended up putting the mattress on the floor. Let's just say we were going through a minimalist phase. When we got to our house in California, we knew it was time to step it up. After weighing lots of options, we ended up upholstering our own: a nice, modern one with a low profile, kitted out in a fawn colored indoor/outdoor fabric. Despite our rudimentary upholstery skills, it turned out well! (Photos to come). Off-the-rack pegboard, a slice of incredible stone, and everything in between: you've got lots of options here. 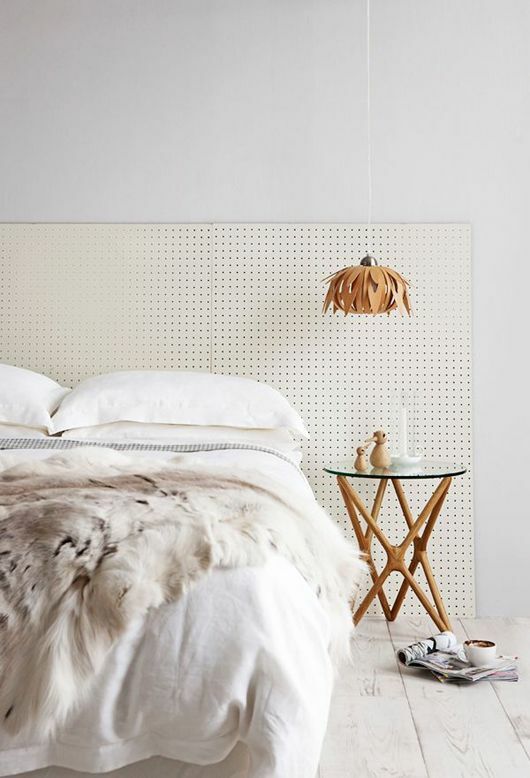 So rather than holding out for the "perfect" headboard, try mixing it up! Your best bet may not be a piece of furniture at all.